For those of you who are lucky enough to have a laptop or computer with a biometric sensor, such as a fingerprint reader, Microsoft Windows 7 makes it incredibly easy to set it up and enable as the default logon mechanism. 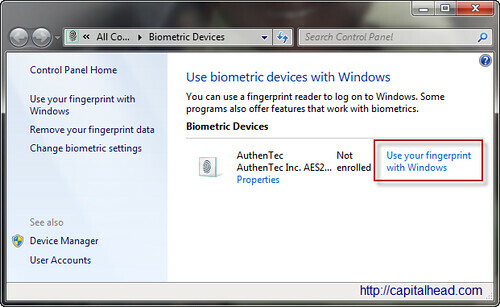 This tutorial will show you how to enable the fingerprint reader in Windows 7 x86 and x64. 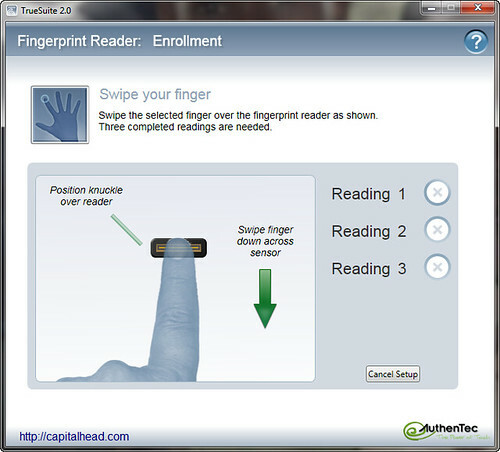 The first thing to remember is that you must have all the drivers to support the fingerprint reader. If you’ve bought a laptop which has the Microsoft Windows Vista or Windows 7 stickers on them, chances are you already have all the required drivers. If you have an older laptop, you might be lucky because Windows 7 x86 & x64 come prepackaged with lots of drivers out of the box. For those biometric fingerprint devices Windows 7 doesn’t know about, it will attempt to download them from the Windows Update website. If you still have problems with your fingerprint reader, contact your computer vendor for driver information. For now, let’s assume that you have a fingerprint reader, you have installed the drivers and are ready to logon using your biometric device. You will need to prove that you are actually the currently logged on user before you can setup a fingerprint for the current user. Go ahead and enter in your password and click OK.
On the Fingerprint Reader: Enrollment dialog, you will need to select which finger you want to setup a profile for. You can setup as many fingers as you require, for this article I’ll setup my right index finger. Go ahead and click on the right index finger to set it up. On the Swipe your finger dialog, you must swipe your finger three times. Complete this task, each time you will be shown whether the swipe was successful or not by either a green tick or red cross next to the Reading buttons. 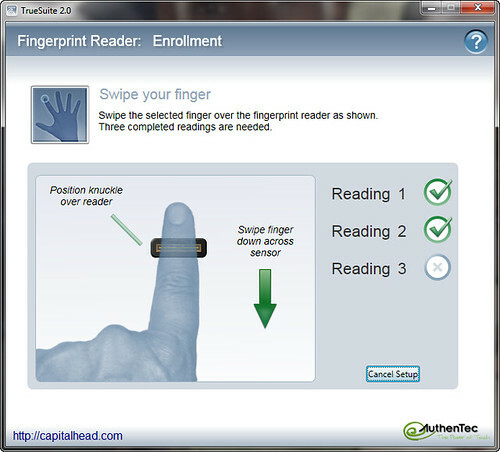 Notice the green tick next to each Fingerprint reading. Once you have completed the three successful swipes the Congratulations page should appear. On the Congratulations dialog, click Finish. 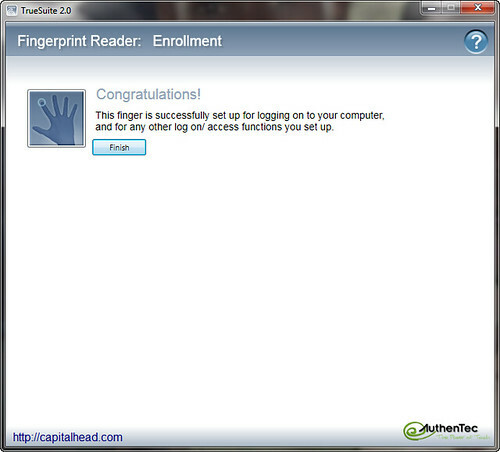 You will be taken back to the main fingerprint enrollment page. Notice that the right index finger is now glowing green, meaning it has been setup for fingerprint logon. Click Finish to complete the process. To test the fingerprint reader and that the enrollment process worked, either log off or lock Windows 7, by pressing the Windows Key + L. You should now see a fingerprint icon instead of your photo as the default logon mechanism. To logon, simply swipe your right index finger, or the finger you used to setup the fingerprint enrollment, over the fingerprint reader, and Et Voilà. This article described an easy method of configuring Microsoft Windows 7 x86 and x64 with a biometric fingerprint reader. The process described in this article, enables a vast majority of users to at least be able to gain an understanding of what’s involved in setting up Windows 7 Logon with the fingerprint reader, if not completely demonstrate a step by step process. Overall, setting up the Fingerprint Logon in Windows 7 was surprisingly easy and very quick. The end result: well, for those of us who are lazy and can’t be bothered typing the fingerprint method does the trick.